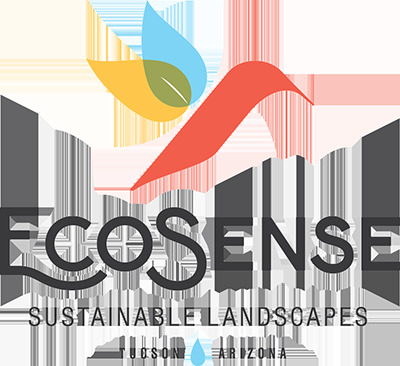 EcoSense Sustainable Landscapes is a full service landscape company in Tucson, Arizona. We specialize in Rainwater Harvesting, 100-percent Organic Maintenance, Native and Arid-Adapted Plant Design, Habitat Restoration, Greywater Harvesting, Erosion and Flood Control, and Gutter Installation. We design, install, and maintain landscapes that fit into the natural beauty of the Sonoran Desert. Our goal is to develop resilient, low-maintenance landscapes, with zero runoff, that do not require municipal water once established. Robust outdoor living designs that integrate native plants and habitat creation, attract wildlife, use regenerative design strategies, and achieve “zero-runoff” goals that directly support groundwater recharge. Analyzing on-site water sources for maximum benefit and striving to create landscapes that consume zero municipal water while also protecting and adding value to your most valuable investment—your home! Low to no maintenance, multi-year design phasing, resiliency planning, including transitioning to rainwater for domestic water supply.